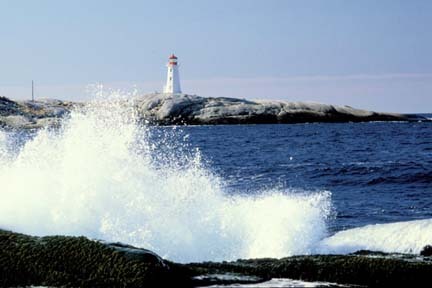 For visitors' information, go to Peggy's Cove Lighthouse on Facebook. Peggy's Cove is one of the most popular tourist spots in Nova Scotia and the lighthouse may be the most photographed in the world. Visitor's are able to mail their post cards at the Post Office inside the lower level of the lighthouse. 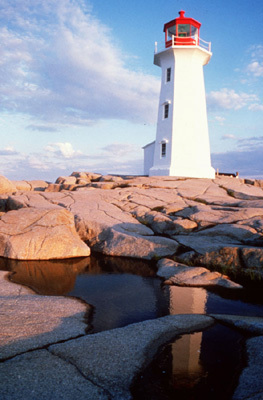 Peggy's Cove and the lighthouse may be reached on Highway 333 from Halifax, or Highway 103 from Halifax to Exit 5 and then Highway 333. While no doubt the most well-known lighthouse in Canada and one of the most photographed lighthouses in the world, the history of the light at Peggy's Cove is little known. Various versions account for the name. 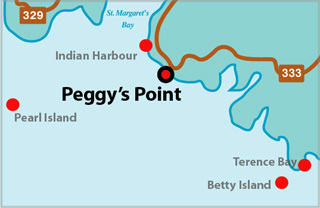 Peggy is the nickname for Margaret and the community may have acquired the name from nearby Saint Margaret's Bay, especially as the point marks the eastern entrance to the bay. Other accounts suggest Peggy was an early settler. 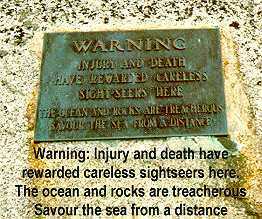 A popular romantic version says a woman named Peggy was the only survivor of a shipwreck and there are even American families that even claim descent from the shipwrecked Peggy. In any case, it was decided to erect a light to mark the eastern entrance to St. Margaret's Bay in 1868. 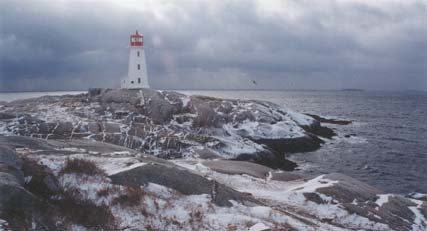 While best known as "the Peggy's Cove Lighthouse", it was and remains, officially know as the Peggy's Point Lighthouse as its purpose is to mark the point, not the cove. The cove has its own small light on the government wharf. The first lighthouse was a wooden tower, built atop a keeper's dwelling at the point. It was a red light and used a catoptric reflector (a round silver-plated mirror) to magnify the kerosene oil lamp. The wooden tower, built atop a keeper's dwelling was replaced by the present tower in 1915, a pleasing and stout concrete octagon 50 feet west of the original light. The keeper's dwelling remained for many years nearby as did a tall flagpole displaying coded black cones and balls to warn of bad weather approaching. The new lighthouse showed a white light from a dioptric lens, a series of glass prisms, to magnify the light. Several colour and character changes followed, the most recent being the change from white to green in 1979. Another very visible change (which helps date earlier colour photos) was in 1969 when the iron lantern on top of the tower was changed from white paint to red paint. The light is a white octagonal concrete tower, 50 feet (15m) high. Light Characteristic: 1992: Fixed Green. 2009: Fixed Red. Light Height: 067ft feet above water level. Characteristic: 1992: Fixed Green. 2009: Fixed Red.